Ozone Park, Queens, New York City, U.S.
Gerald Maurice Edelman (July 1, 1929 – May 17, 2014) was an American biologist. He shared the 1972 Nobel Prize in Physiology or Medicine with Rodney Robert Porter. They won the award for their work on the immune system. 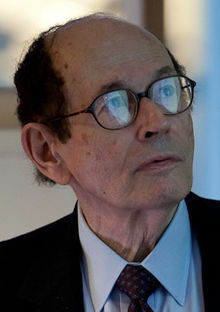 Edelman's Nobel Prize-winning research concerned discovery of the structure of antibody molecules. Edelman died from Parkinson's disease and prostate cancer in La Jolla, California, aged 84. ↑ "Gerald Edelman, Nobel laureate dies". U-T San Diego.com. May 20, 2014. Retrieved May 21, 2014. ↑ "Gerald M. Edelman, Nobel Prize-winning scientist, dies at 84". Washington Post.com. May 23, 2014. Retrieved May 23, 2014. ↑ "The Nobel Prize in Physiology or Medicine 1972". Retrieved 2007-09-27. ↑ Structural differences among antibodies of different specificities by G. M. Edelman, B. Benacerraf, Z. Ovary and M. D. Poulik in Proc Natl Acad Sci U S A (1961) volume 47, pages 1751-1758. ↑ "Gerald M. Edelman, Nobel Laureate and 'Neural Darwinist,' Dies at 84". The New York Times.com. May 23, 2014. Retrieved May 23, 2014.